Real talk part deux: I nearly considered moving my Lazy Sunday posting schtick to today because, um, it’s Friday night and I’ve got things to do. (“Things” being “sitting around in my flannel PJ pants reading Agatha Christie and maybe drinking some wine if things get crazy.”) And then I thought, No, because “Lazy Friday” just sounds stupid. 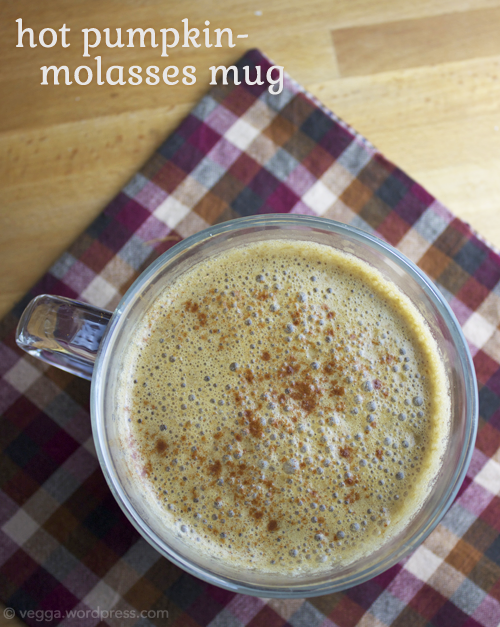 And then I thought, Maybe I can repurpose my Hot Molasses Mug! Blackstrap molasses has tons of calcium, and so does almond milk! And then I thought, No, you lazy fool. Stop being so lazy. And then I remembered the Kathy Patalsky’s Hot Pumpkin Mug that I made last year for MoFo, and I realized that those mugs needed to meet. Stat. Blend all ingredients with a standard blender or an immersion blender until well combined. Transfer to a small saucepan and head over medium-low until the mixture begins to steam. Pour into a mug and enjoy. I am, admittedly, still pretty lazy, because this recipe is obscenely easy. But holy heck is it good! It’s the perfect blend of two of my favorite flavors, with just a touch of pumpkin pie spices. And—get this—you will get 65% of your recommended daily value of calcium in this mug. 65%! (Well, assuming you use Trader Joe’s Unsweetened Original Almond Milk…) The iron content is not too shabby either at 24%. Guess my laziness paid off this time! holy cow!!! this sounds really good and really special. I would have never thought of something like this – but it sounds like a nice toasty alternative to coffee or hot cocoa… I can’t wait to try this. Thanks for overcoming your laziness to share this idea! Pingback: Vegan Mofo Day 20 – fried tofu sticks & bean celeriac salad | gebratener Tofu und Bohnen-Sellerie-Salat | VGNGF = vegan, glutenfree, delicious. Sipping this now and it is DELICIOUS! Would like it to have a bit more kick to it for next time. More spices, you think?